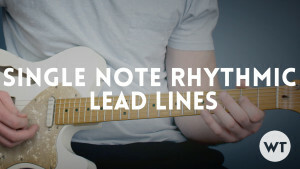 In this video guitar lesson we learn how how to play some really cool sounding lead/rhythm type stuff using one single note. It couldn’t be easier! We’ll also take it a step further and how you how to embellish your one note with just a few more notes to make it even more awesome.